Facebook are really pushing the live streaming at the moment. First it was live video, then it was live 360º video and now they’re rolling out the ability to live stream audio. It’s like TV but without the pictures – ground breaking! 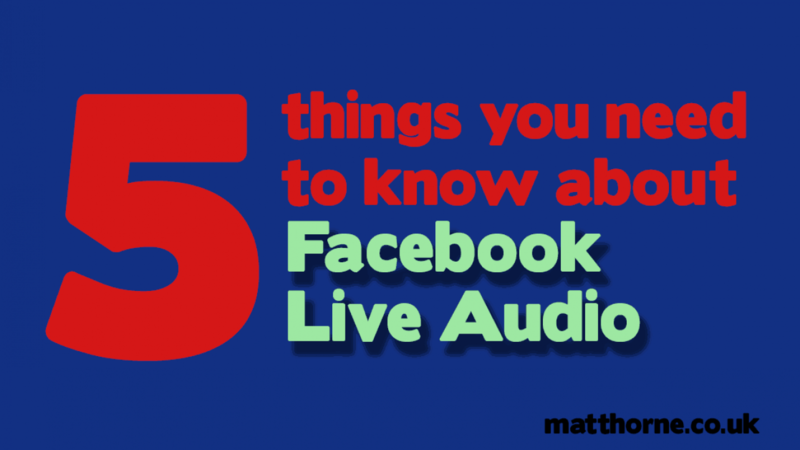 Whether it’s a cynical move to steal the audience of yet another traditional medium, or a great feature to help those without video cameras reach a live audience – it’s coming to a Page near you, and here are 5 things you should know about Facebook Live Audio. Not to say this won’t change in the future (like it did with live video), but Facebook Live Audio is only available on its mobile app. That means you’re stuck with your mobile device’s microphone as the audio source. Stuck that is, unless you connect up an entire mixing desk with loads of high quality audio inputs to your device’s input and stream audio that way – just sayin’. Before you go live with your audio you get to pick a cover image for the stream. This is because when the post appears in the news feed it looks very much like a regular video post. Only when you click the play button the images aren’t moving and you just get sound. This may just be an early release bug but the comments look horrific when you’re live. Not in a “Best of YouTube community” comments horrific, but visually. When replying to comments they weren’t posting in the nice clean threaded style. Instead they were just going in chronological order on the live post, meaning all context and relevance was lost to people who might stumble across the post. Not only that but the original commentator might not get a notification they’ve had a reply. Not a great user experience. Luckily, once the stream had finished and the archive version was shared the comments were showing threaded so it wasn’t the end of the world. Just annoying for those enjoying the live experience. It’s well known that Facebook likes to give new features a big boost with organic reach to tease people in to using it. They’ve been doing it with live video for over a year now, which is why going live is one of the main ways to boost your reach (if that metric is important to you). But is that the case with Facebook Live Audio? No, not really. For an hour long stream the post had an organic reach lower than you’d expect from a live video stream, and on average for a website link post. So it’s not going to break the stats records but still a good way to reach people. This is one of the other major measures of a post’s performance on Facebook. Historically with live video streams you’d get a huge increase in organic reach without a similar increase in engagement. So when working out engagement rates (percentage of people that engaged in relation to the number reached) the posts do pretty poorly. With Live Audio this didn’t seem to be the case. As the post received average organic reach, it also got an average engagement rate. Is Live Audio the future? Considering there doesn’t seem to be a boost in organic reach I don’t see live audio having a major advantage over live video on Facebook. Back in the day, when video cameras on mobile devices weren’t that great and fast mobile bandwidth was an issue, live audio would have been a great tool to use for people where video wasn’t an option. But this is 2017, we have 4G, super fast wireless everywhere and smartphones with cameras that rival small Hollywood production companies* – if you’re going to go live you might as well take advantage of the organic boost live video gives you and go live with moving pictures.